You’ll never have to wade thru an email thread again searching to see who provided which piece of feedback. 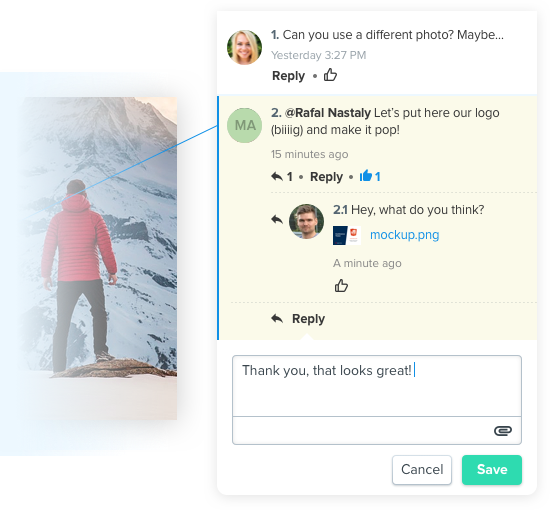 Ziflow automatically incorporates comments and attachments onto the asset being reviewed in real time for everyone to see. 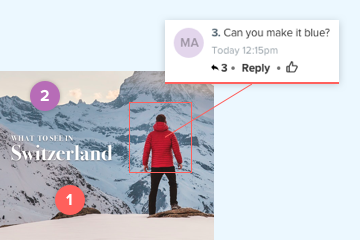 Ziflow’s variety of markup tools (lines, arrows, squares, ovals and text select) allow your reviewers to provide very specific and actionable feedback. Markup tools can be combined to provide more granular direction on a single annotation. 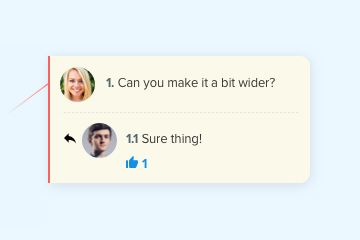 All comments, replies, attachments, and even thumbs-up notations are saved and maintained on the proof when new versions are added. You’ll always have access to the who, what, when for historical, compliance or auditing purposes. 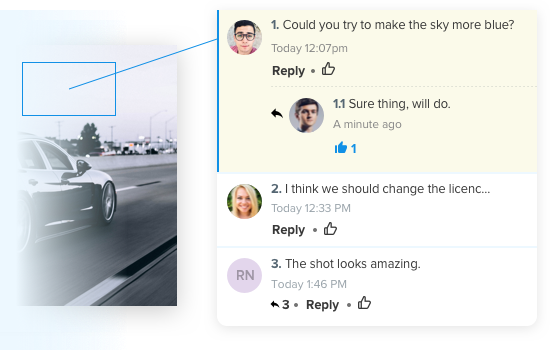 With threaded comments, attachments on comments, simple thumbs up notations and “@” mentions, Ziflow enables real-time collaboration between team members, regardless of their location. This speeds up project delivery and reduces errors created by ambiguity. Smart commenting and markup tools put an end to the ambiguous feedback that causes confusion, errors and rework. 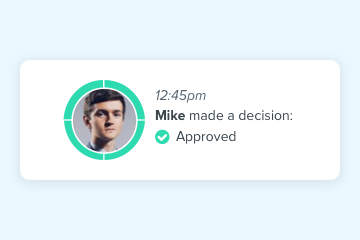 With markups easily viewed by all team members, projects can progress with confidence. Viewing all comments and threads from within the proof removes the need to wade through email threads from multiple recipients. Provide effective feedback for the best possible work. Create an account now.